Rock Lords: Narlie/Narly/Narli - Which is the correct spelling? Narlie/Narly/Narli - Which is the correct spelling? In the magical future internet web 2.0 world of the 21st century, it seems that all human knowledge is finally at our fingertips. We are only one click away from learning all about the most ancient of cultures, the most arcane of texts and the most obscure of facts. 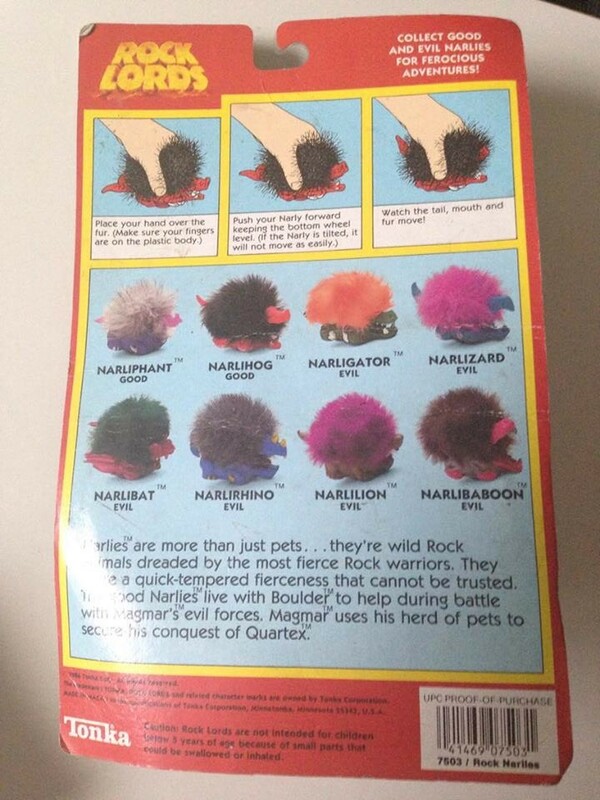 However, the correct spelling of 'Narlie' is not amongst these. The Transformers Wiki, usually the bastion of sanity, has been bouncing between 'Narli' and 'Narly', eventually embarking on the enterprising solution of editing the fan club Facebook page to read 'Narly' due to the text on some of the cards (creating a bit of a circular evidence loop!). This is odd, as I'd always thought the singular of 'Narlies' was 'Narlie'. Who is right? There is actually compelling evidence for each spelling, and in this article I will lay out the argument for each and let you, the people decide (but the answer is 'Narlie'). Why does this matter? Well, it doesn't. But it would be nice to be able to search for Narlies on ebay with just one search term! Whilst 'Narly' would seem a logical spelling, the 'y' ending being a popular singular to words with plurals ending in 'ies', as a word it feels ugly and wrong to me. What self respecting person could possibly want to use such a horrible-looking word? How could they look in themselves in the mirror in the morning? The key evidence for 'Narly' is found in the packaging of some of the Tonka series one Narlies. The front of the card clearly states 'Narly' on the bottom right and so this is argument over, right? Wrong! The exact same evidence is also used by the 'Narli' crowd. If you turn the Narligator card over, the card uses 'Narli' as the singular when referring to Narligator's bio. If we take this card as evidence, we have to accept both. "Narly" bottom right and... not! Added to this is that this spelling is not found on variants of the Narlie series one card, neither is it on the series two cards. Did Tonka realise their mistake and remove the incorrect spelling? Or maybe not, as it does appear on the back of series 2 Tonka cards (despite being removed from the front). 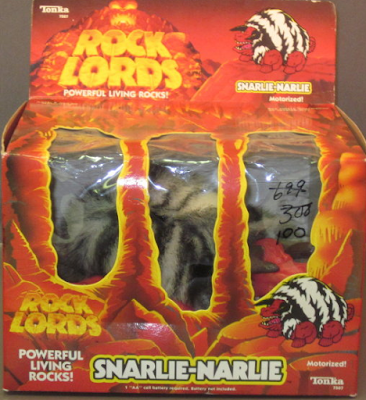 "Narlies" is constantly presented with a TM both on this and all Bandai Europe merchandise including packing cases. There is no similar trademark against 'Narly' but there is against 'Snarlie-Narlie'. The 'Narly' spelling is also absent from the Bandai Europe cards. The only other mention of 'Narly' that I have found comes from an article in the Sydney Morning Herald from 14th September 1986. Now, I don't wish to cast aspersions on the journalistic integrity of the Sydney Morning Herald, but this is an advertisement for a competition rather than a serious academic look at Narlie culture. 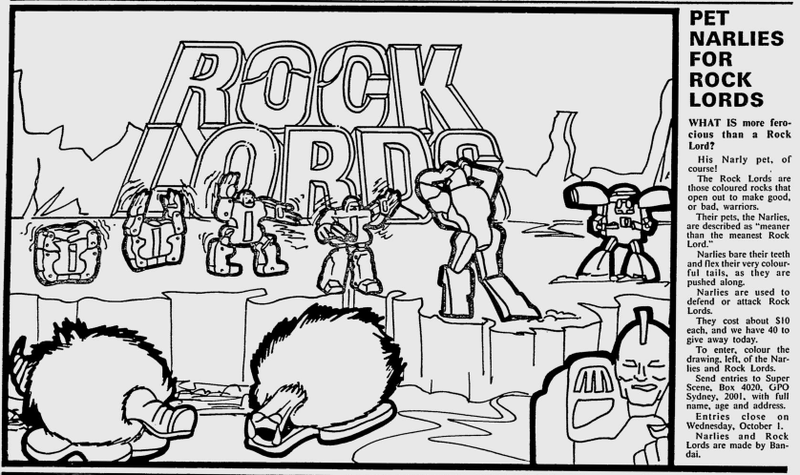 Still, it has a picture for you to colour in. 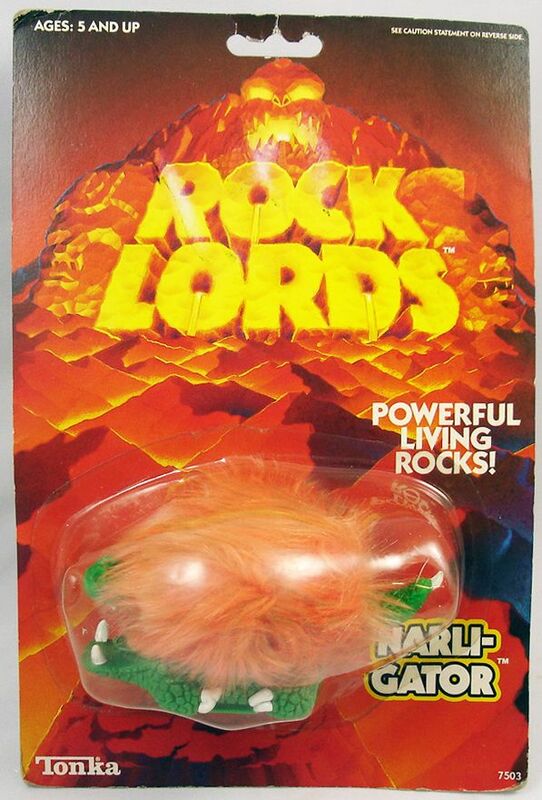 'Narli' was the previously favoured golden child of TFwiki until it was overthrown by 'Narly' using the "Narly was on the packaging" argument. But so was 'Narli'. 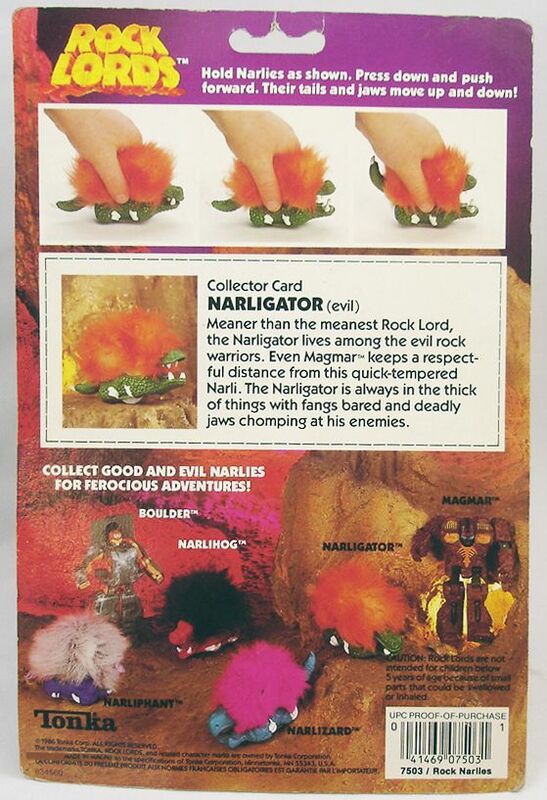 As mentioned above, Narligator's bio explicitly calls him a "Narli". Perhaps this was a typo for "Narlie" or perhaps it was deliberate. But the other side of the card said "Narly" so there wasn't much cohesiveness going on at Tonka at the time! The wider argument used by people who propose this spelling is that "Narli" appears in the Narlie names. 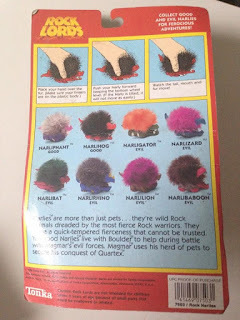 Narlihog, Narlilion, Narliphant and so on, all have "Narli" and so it must be the singular. 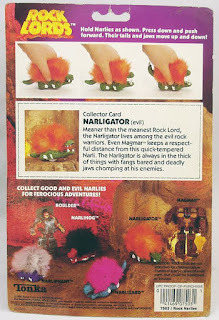 Tonka cards spell their names with a hyphen on the front, so that we get "Narli-Hog", implying "Narli" is a separate word (though the same cards use the unhyphenated versions on the back which shoots down that argument a bit). Bandai cards use the unhyphenated versions throughout, if you were wondering. My argument against 'Narli' is that I feel the Narlie names to be a portmanteau, a combination of two words which get mixed into one rather than literally one word after another, thus 'Narli' + 'Alligator' becomes 'Narligator'. 'Narlie' + 'Lizard' becomes 'Narlizard'. Or 'Narlinurtle' if you are feeling European. The names just wouldn't work if you kept the 'e', and it also raises the question as to why they're not called 'Narlygator' etc, if 'Narly' was the correct singular. My personal preference (as you might have already guessed) is 'Narlie'. I prefer the way it is spelled, and think it's a nicer word. You may argue that "words which end in '-ies' have their singular as ending in '-y-'" but that isn't true - take 'birdie', 'newbie', and 'zombie' for example. The English language is a strange thing, and spelling takes second place to historical cultural considerations. There's also a lot of evidence for this too. 'Narlie' as a singular appears in at least one catalogue that I've found, with no other variations of this spelling. Of course, you could apply the same argument to the 'Narly'/'Narli' card debacle. 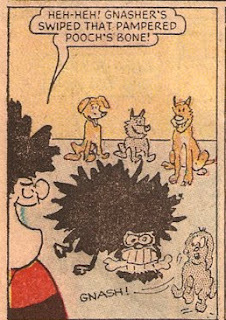 For me, the clincher is in Snarlie-Narlie. The king of the Narlies has "Narlie" as a singular in his name, and surely what the king wants should govern the laws of the land! It clearly isn't a portmanteau word like the other Narlies, as "Narlie" appears at the end. It's not something that could get missed in copywriting, as the 'Narly'/'Narli' spelling on the same cards shows. The correct spelling of 'snarly' is with a 'y', so the spelling was deliberately changed to match with the spelling of 'Narlie' - if 'Narly' was the singular, would it not have been easier not to change the spelling? 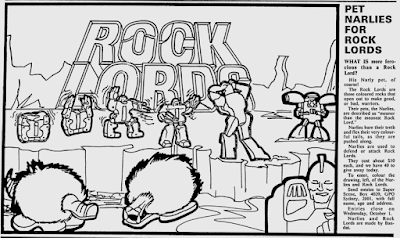 It's also an in-world name as well as an out-of-world packaging item. This is a clear decision from Tonka and Bandai in presenting a singular of the spelling of the word 'Narlie'. There's a fourth wildcard contingent who seems to be convinced that Narlie is spelled 'Gnarlie'. I've not been able to find any official evidence for this spelling anywhere, and can only conclude that these people have been reading 'The Beano' too much and get confused with Dennis the Menace's pet dog. Of course, Gnasher does look rather like a Narlie; Tonka clearly missed a trick back in the 80s by not releasing a Gnasher-themed Narlie. For me, weighing up the evidence, 'Narlie' is the winner. The sheer inconsistency in official spelling is seemingly due to Tonka and Bandai only ever concentrating on 'Narlies' as a plural. I'd be more convinced by 'Narly' if the word hadn't vanished off the packaging as if a mistake (and the same packaging didn't have alternate spellings on the reverse! ), and the clear and unambiguous use of 'Narlie' in 'Snarlie-Narie' clinches the deal for me. But this is a democracy! What do you think? Vote in the poll below - let us decide this once and for al!